Before getting started, it's important to mention that these measurements are all done with the latest firmware available when the measurements were gathered in May 2018. The latest downloads can be found here. The version currently is: UDP20X-56-0244, with loader TF0035, and MCU205-01-1220 released in March 2018. As usual, with firmware updates there could be changes to measurements and features added over time (hopefully for the better!). Yeah, that's more like it for an accurate square wave. Looks pretty good. The two channels overlay nicely on each other which is of course what you want to see with precise channel balance. Notice the general absence of pre- or post-ringing. Peak voltage is at 3V or 2.1Vrms for a sine wave. On the left are the XLR channels plugged into a XLR --> RCA converter. This won't demonstrate the quality of the signal (we'll directly measure the XLR output resolution next time with RightMark measurements), for now it does demonstrate again the excellent channel balance. On the right is the same signal from the front L/R channels of the 7.1 RCA jacks. Line level and XLR outputs look great overall. 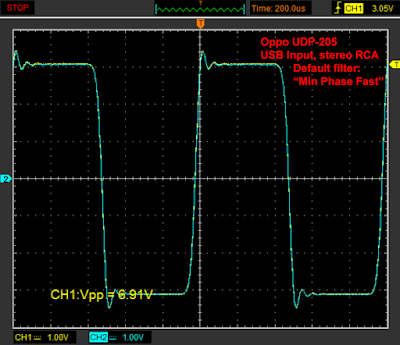 And last but not least, there's the headphone output with a peak voltage 6.25V or 4.4Vrms. The manual lists the maximum output power as 590mW into 32-ohms nominal, and <0.1-ohms output impedance. 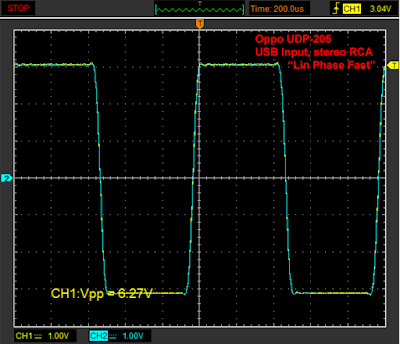 My own measurements do show <1-ohm output impedance across a 20-ohm load using a 1kHz signal. This headphone amp should sound great with both low and high impedance headphones (although it'd be a shame to use low impedance inexpensive earbuds meant for mobile applications on this!). Sounds lovely with my AKG Q701 and Sennheiser HD800; plenty of power, very detailed with good bass level and clean definition. Most of them are relatively self-explanatory. I know filters are a tough part of the reviewing process. As I'm sure you've already seen with most purely-subjective reviews, the reviewer will vaguely talking about trying the filter options here and there, then just settle on one with claims that there's more "air", "better sound stage" or some other equally vague rationale. But to truly understand what filters do and the effects, let's have a look at both the frequency domain ("Digital Filter Composite" graph based on the idea by Juergen Reis) as well as the impulse response to give us an idea of the temporal dimension. Just to break up the filter options and get away from one massive diagram, let's look at the first 3 filters together, then the last 4 can be grouped as the descriptions are already quite self-explanatory. Notice that both filters 1 & 3 are very similar. Both have a steep decline around Nyquist with the "Brick Wall" having a bit better imaging suppression. It would be hard to argue that the difference would be at all audible! The "Corrected Minimum Phase Fast" filter is interesting. It's a type of intermediate phase setting with a smaller amount of pre-ringing, while maintaining a steep roll-off with good suppression of ultrasonic artifacts. Looking at the 19 and 20kHz peaks, notice that the 20kHz peak is notably lower than 19kHz indicating that the frequency response will start rolling off before 20kHz compared to #1 and #3. Yup, rather straight forward. The "slow" filters are relaxed and allow ultrasonic imaging to seep through as you can see with the 19 & 20kHz signal (and the 24 & 25kHz "image"). I'm quite happy with the standard "Linear Phase Fast" setting as it does a great job with the filtering and handles intersample overloads well. Each of the impulse responses have maintained absolute phase. 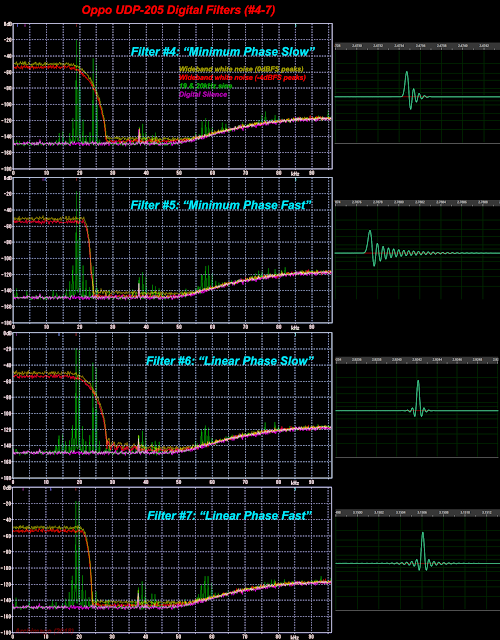 Interestingly, notice that none of them are showing any significant overloading with the wideband white noise signals! 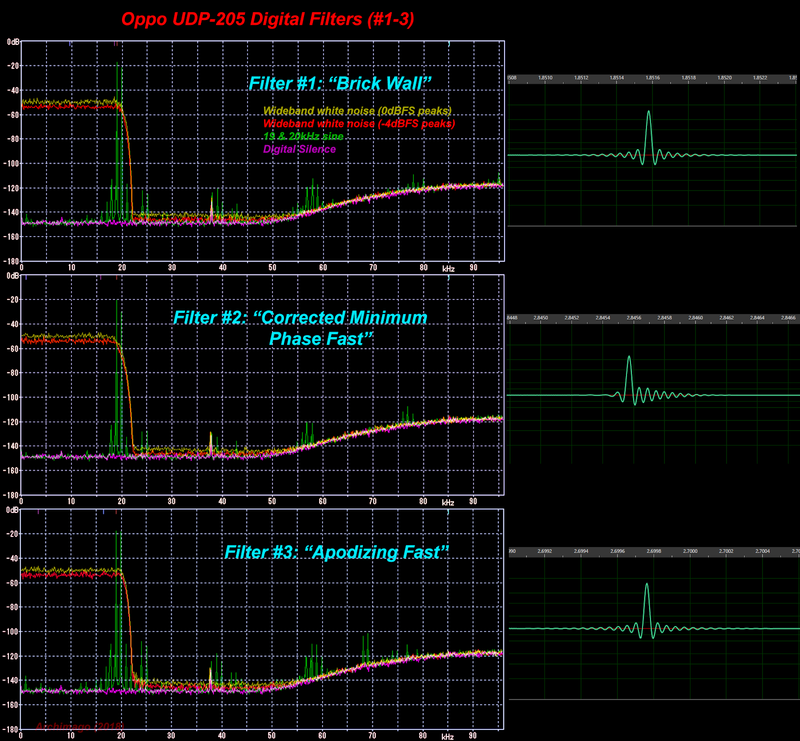 This is in fact one of the few times I have seen a device where every one of the filter options appear to have enough overhead to not show intersample overload with my "DFC" plots using the 0dBFS-peak wideband white noise. (The only other device was the Light Harmonic Geek Out V2 a number of years back.) Impressive attention to detail and high level of engineering, Oppo. A significant improvement over the Sonica DAC last year where I initially complained about the digital filter setting and Oppo quickly released a new firmware to remedy the situation. 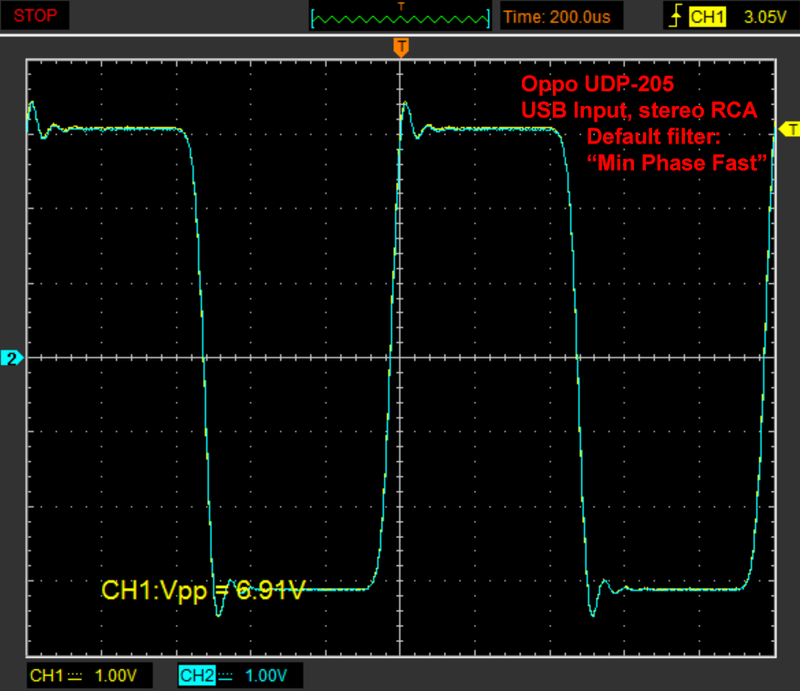 As you can see, this is also why I stated in the Oppo UDP-205 preview that if MQA were to be incorporated into this device's USB-B input, it would be wise to make sure that MQA filters only are active when intended rather than spill over into standard "unauthenticated" PCM data. This should be the situation with other devices as well but we have already seen cases where MQA filters stay active long after their intent (like the Mytek Brooklyn DAC+). 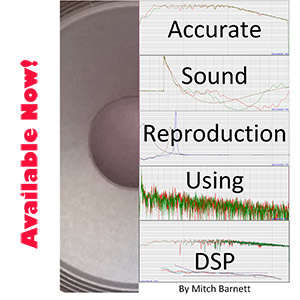 Compared to the filter options above, MQA filters allow much more imaging to seep through (as per the measurements from the Dragonfly Black using these filters to "render") plus they demonstrate strong intersample overloading with high amplitude signals, creating extra clipping distortion which could be a problem with modern, highly-compressed audio if the peaks aren't attenuated by a few dBs. Note that the "Minimum Phase" and "Linear Phase" filters have the same general "Fast" and "Slow" frequency responses. 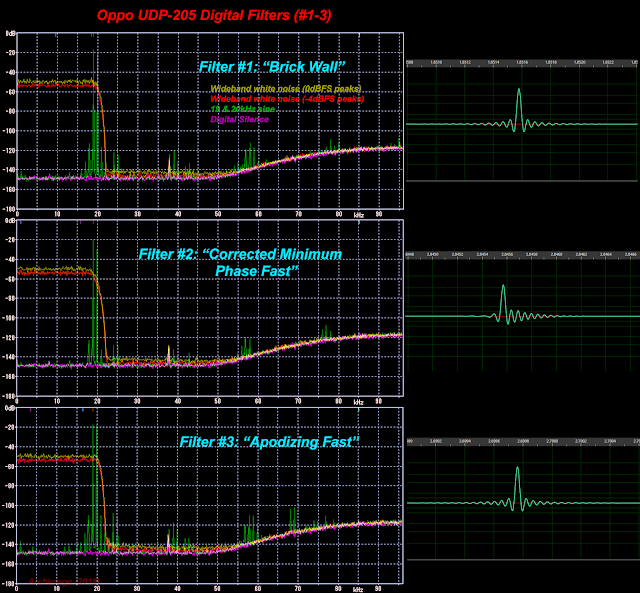 The other oddity is the "Apodizing Fast" filter with its rippled-looking frequency response. Again, really subtle, objectively demonstrable and I doubt any human ear would be able to hear this. The obvious question you must be asking: can I hear a difference based on the filter settings? The answer is "no", I personally cannot, not with these settings and not with standard music! That is not to say filtering is never audible - it's noticeable with the PonoPlayer / Ayre filter for example. Remember that years ago, we did a blind test looking at minimum phase vs. linear phase, and even with that the results did not show group audibility preferences. This makes sense since recent discussions demonstrated that "ringing" is not an issue in well produced music and generally phase anomalies introduced by minimum phase filtering isn't all that audible either even though I think it's not technically "ideal". Notice the slightly higher noise level with "Arch's Intermediate" as I attenuated the signal by 4dB before filtering to prevent overloading of the 0dBFS wideband white noise. This chart is also a preview of forthcoming measurements - notice that I'm measuring down to almost 20-bits of resolution. This is the best I've seen and the limit of my humble Focusrite Forte ADC. 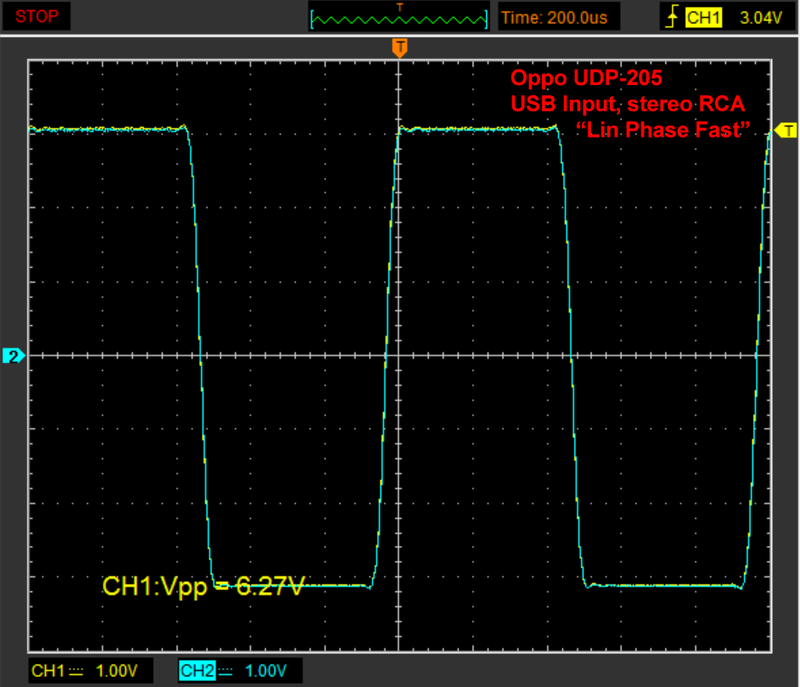 Here's Part II of the Oppo UDP-205 measurements. Oh look... Bob Stuart's Q&As have now gone beyond the printed word and into audio/video courtesy of Darko Audio. John Darko I think did a good job with the questions posed which include a range of talking points. From my perspective, despite ample opportunities given, Stuart doesn't scratch the surface into what MQA actually does nor provides clear indication of beneficial effects beyond the usual vague claims. As expressed in my Computer Audiophile review a couple months back, there are a number of technical concerns about the value of MQA's digital processing and questions around the non-sound-quality aspects of this technique (what does "authenticated" mean and DRM elements). It's getting harder to watch Mr. Stuart explaining these things without actually getting into the technical details after all these years. In my opinion, the answers sound emotionally and intellectually hollow and apologetic rather than an inventor talking passionately about this so-called "revolutionary" product he has made or why it's actually exciting. In a technological age where many consumers understand generally how things work even if not the exact mathematical details, unless interviews like this go into some concrete details, it comes across unconvincing (again, IMO of course). In the Part 1 video (6:30), he says "you take a song and you feed the lossless file into a DAC and then play it and you play it again and get a different answer... because the arithmetic part and the analogue parts of a DAC do something different every time you play it." How ridiculous does that sound? Surely Mr. Darko must be scratching his head at this answer! I can understand the analogue portion not being exact with each playback, but does the arithmetic portion of a digital filter throw out different results internally? According to Stuart, this is why "pure losslessness" doesn't exit. Yes, on a very microscopic level, each DAC playback would be slightly different depending on physical factors like the exact temperature of one's gear affecting noise, maybe microscopic power fluctuations, interference from nearby devices, slight timing variation from the clock, etc... But it's not this minutia that we're talking about with MQA, right? Losslessness has a clear definition as in "exact", errorless data storage, transmission and recovery. The only reason he gets bugged about the fact that MQA is lossy is because he played loose with the definition in the first place by claiming MQA is "lossless" and that it was able to "exactly" present the sound of the studio. It really boils down to what Stuart said at 8:25, doesn't it? "The fact that the A-to-D and D-to-A change the sound is the thing we're tackling". What if we disagree on this "fact"? What if modern ADC and DACs are actually "transparent"? Suppose even if the ADC/DAC are not totally transparent but might introduce only a very small change to the reproduction of the waveform, how much difference would we actually notice since consumers were never in the studio? And even if MQA could bring us objectively "closer" to the actual "studio sound" (no evidence at all of this! ), would it even matter if in fact the subjective differences are trivial? Notice these days that Stuart isn't using the word "deblurring" as much? After all that's said and done, along with the skepticism not only from audiophile enthusiasts but also among the industry, shouldn't he spend a bit more time proving to everyone that their technique actually does some "deblurring"? Seriously, that's all that needs to be said about MQA and these videos. The rest of it talks about money being charged, running a business, maintaining an ecosystem, more about lossy/lossless (~14:00, "no DAC is lossless", yeesh). Look man, nobody's saying a company or individual should not be making money on a good product! Just make sure it's actually a good product that provides value! On yeah, not directly MQA related, one last interesting and funny comment was made at Part 2, 10:00 - "it all goes back to why samplerates exploded". Seriously man, audio bit rates and sample rates "exploded" because certain audiophiles and the magazines told people using sighted listening anecdotes that 24/192 sounded better than 24/48 or 24/96!!! That the bigger the number, the better the sound quality. That's the only reason it exploded with many albums being nothing more than just upsampling. As I've said before, I really do not see any benefit beyond 24/96 (even that is likely significantly more than needed - perhaps down to something like 18/50 is all any human can realistically argue for even with filter effects). Of course, 24/96 can be streamed through lossless compression these days without too much effort over typical broadband (3.5Mbps with 25% compression isn't too much to ask!). Very busy at work and heading off on a business trip to beautiful Montréal. Happy June. Chat later and hope you're all enjoying some wonderful music! Looks like the McGill listening test results for MQA came out as a poster at the recent AES meeting in Milan with expert listeners! Guess what... As suspected by our blind listening test last year; "Data shows that listeners were not able to significantly discriminate between MQA encoded files and the unprocessed original due to several interaction effects." Not sure what "interaction effects" are being spoken of. If anyone was at the AES or have access to the results, perhaps they can explain. But looks like the encoded files didn't sound any different. Like I said before, I think this is good in that MQA can be transparent (despite objective technical limitations of the lossy encoding compared to an original hi-res master), but this whole "deblurring" bit seems to convey no benefit to the sound as suspected. Bottom line then is that here's more evidence for audiophiles that there's no reason to bother with MQA from a sound quality perspective. I guess the audiophile writers who heard remarkable things must have been wrong. Bob Stuart and MQA Ltd. remain unconvincing with hyped expectations. Let's move along shall we?! "The ES9038PRO SABRE DAC also features ESS’ patented 32-bit HyperStreamDAC technology with-122dB total harmonic distortion plus noise (THD+N). A typical competitive, 32-Bit 8-Channel DAC using a delta-sigma architecture features-107dB THD+N (0.0004%), which when subjected to listening tests does not equal the clarity and sound stage of the ES9038PRO." They didn't mention "controlled double-blind" though. Then they support MQA... I wonder if they can achieve 122dB THD+N or not when using the MQA filters. Maybe only at 1kHz? How about other stuff like IMD and so on? It's understandable that those ESS chips have programmable filters so MQA support is possible without additional cost. I also fully aware that measurable distortion doesn't mean audible distortion unless at extremely level, but if they use measurement as a selling point, why they are going to support MQA at the first place? Every measurement based on highly relaxed filters or NOS I read on Stereophile and your website is poorer than traditional sharp filters. That's really some self-contradictory marketing from ESS. 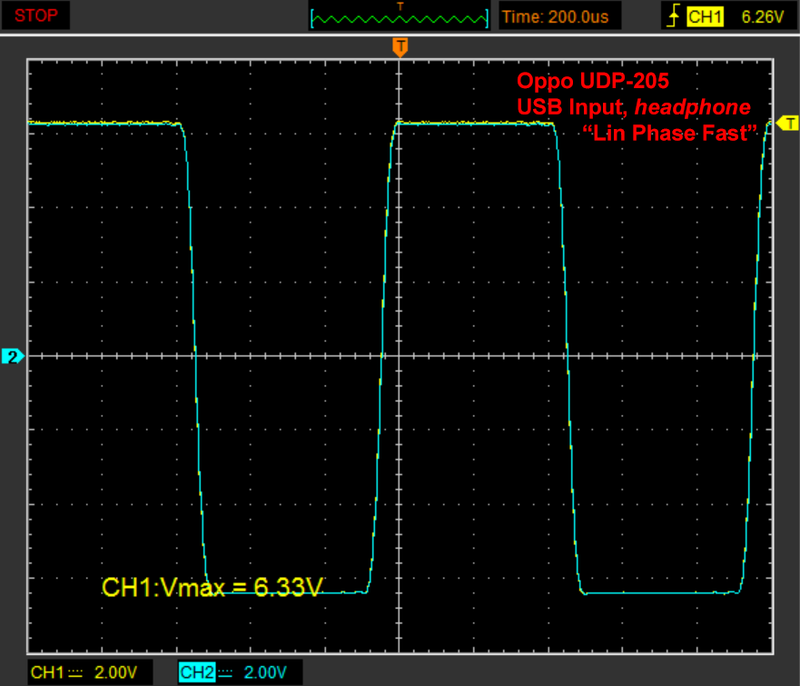 Don't know if the intersample headroom is a feature of the ESS chip or not, but I guess Oppo may just attenuated the signal themselves in their newer products after receiving your complaint and reading your reviews. Knowing their flagship DAC will outperform your Focusrite's ADC so there will not be any SNR penalty anyway. Yeah, it is funny isn't it with the upcoming "built in" MQA support. The upcoming chips that handle MQA seem to be lower-end products so maybe quoting low noise performance isn't a priority. Yeah, possible that Oppo's filters self-attenuated to handle the extra headroom. Given the low-noise performance of the ES9038Pro, there's plenty of extra dB's to spare so can't complain at all! P21-3 A Subjective Evaluation of High Bitrate Coding of Music: "A subjective listening test was carried out to assess the perceived difference in quality between AAC-LC at 320 kbps and an uncompressed reference, using the method of ITU-R BS.1116. Twelve audio samples were used in the test, which included orchestral, jazz, vocal music, and speech. A total of 18 participants with critical listening experience took part in the experiment. The results showed no perceptible difference between AAC-LC at 320 kbps and the reference." P21-1 Quantization with Signal Adding Noise Shaping Using Long Range Look-Ahead Optimization: A re-quantization approach for digital audio signals using noise shaping by extra signal addition is studied. The approach has been proposed by the author but its properties have not been studied well. In this paper, the feature and performance of the approach is investigated. As a result, the...perceptual evaluation is superior in terms of the fineness of the sound source image especially when the optimization horizon used in the additional signal calculation is wide." Cool. AAC-LC 320kbps is transparent. Hmmm, has anyone done similar studies using say a recent version of LAME-encoded MP3 320kbps to show that the older MP3 CODEC itself was less transparent at this bitrate? Or how about 256kbps AAC as sold by Apple? Thanks as always for the great writing and information! It's wonderful when a no-nonsense guy like Mark gets a chance to voice his opinion with decades of experience doing the actual studio work, has the technical background, and industry insights. Nice interview with broad range of topics ranging from his book, to hi-res, to DSD, to MQA, to Pono, to vinyl. Even mentioned some cable voodoo :-). Great that Mark is putting this all together in his book as a way to educate audiophiles. I really do hope that as time goes on, more and more of the participants in our hobby will become better equipped to likewise question those things that make no sense. Ultimately, manufacturers and the audiophile press will need to take notice and be responsive to the "elevated standard" of expectations and knowledge base of those they're reaching out to. 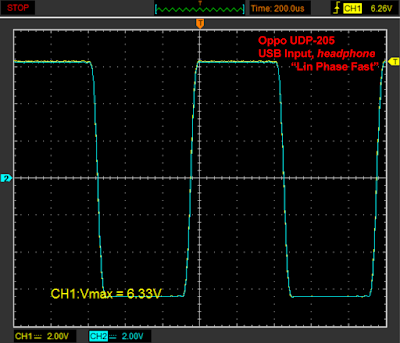 Hi, thanks for an impressive and scientific analysis of the Oppo 205 outputs. My questions will look trivial in comparison, but here they are: 1. are the outputs from the dedicated stereo RCA sockets always the same as the FL and FR RCA sockets? 2. is it possible to reassign the SBR and SBL RCA outputs be reassigned to carry the SR and SL signals too? Currently I use a splitter to take the FL signal to two mono block amps, each of which feeds half of the speakers on a Jade 7 speaker. If the stereo and FL/FR have the same signal, I can eliminate the splitter and plug into both the stereo and FL/FR sockets at the same time. Same with the SR & SL (if I can reassign the signal to the SBR & SBL sockets).